You will earn 4,903 Reward Points. Earn 1 reward point for every 1 dollar spent. Gas regulator 3/4" or 1-1/4"
Master Series Char-broiler with stainless steel front and sides. Broiling area consists of heavy duty rack sections which are easily moved for flat or tilt position broiling. Dual sided, cast iron broiler grates with 1/2" (13mm) rounded bar, (board brand) and diamond (fine) pattern on opposite side. 15,000 BTU (4.39 kW) burners controlled by individual Hi-Lo valves. 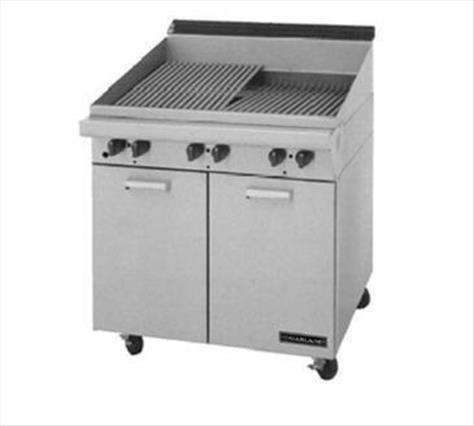 Sentry total flame failure protection for all burners Large capacity full length grease drawers. Heavy-weight, long lasting briquettes. Cabinet, 17" (432mm), 24" (610mm), or 34" (864mm), wide by 34" (869mm) deep, with two stainless steel full-sized hinged doors and front. Natural gas or propane. Available in modular models, suffix BT.